to give a good starting place to help you solve your temperature related problems. for detailed information on all types and designs of temperature sensors. What temperature is being measured and how accurate do you need to measure? How much are you willing to spend and how long do you want the sensor to last? Long lasting sensors operating within their limits. Sensors close to their physical limits or under attack from the process. The type of temperature sensor you choose will depend on the temperature range and accuracy required. Different sensor technologies have different maximum temperatures and also accuracies. What is your required temperature range? The temperature sensor you choose will depend on the usual temperature it will experience and also the maximum over-temperature that may be experienced. Pushing a temperature sensor to its limits for long periods of time could make it develop an error (called drift) and the temperature sensor will record a lower temperature than it is actually experiencing. If you are using the temperature sensor in extreme temperatures its best to use the sensor only once so you don’t get drift. If the sensor experiences temperatures within its operating range drift will not happen and the temperature sensor can be reused many times accurately. What is your desired accuracy? Different types of sensors have different accuracy tolerances. All sensors we manufacture are within defined tolerance bands to European and International standards (BS EN 60584-1, IEC 60751 etc). If small inaccuracies are tolerable in your process then standard sensors are fine. Our sensors are sold to operate within their defined tolerance, although they have not been proven in finished form. All our sensors are made with calibrated materials and we can supply certificates to prove their tolerance. If required we can calibrate a representative sensor from the same batch. A calibration certificate will be supplied in this case. If tighter tolerances are required then all sensors can be supplied with calibration certificates. If you require tight tolerances with high reliability, our sensors can be tested to UKAS laboratory standards and supplied with a UKAS calibration certificate provided. These calibrations are carried out in a fully controlled environment and are the tightest accuracies available. 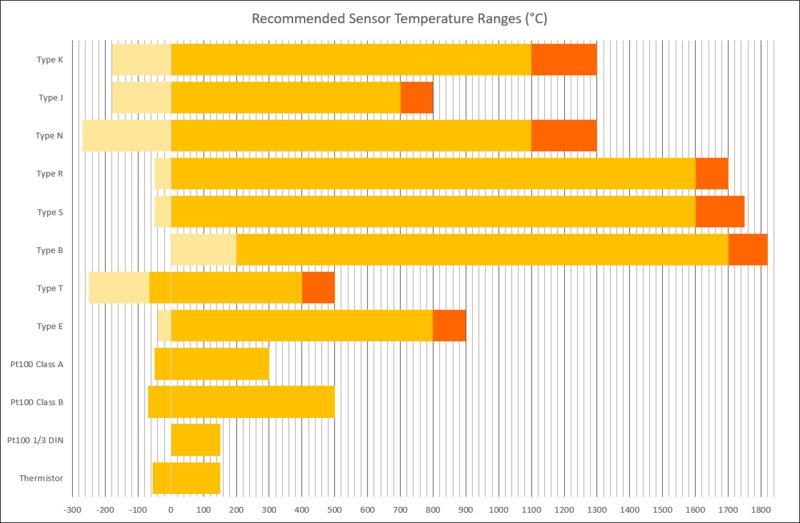 Many variables will affect the price of the temperature sensors you require. If you require lower temperatures, with low accuracy, sensors will generally be cheaper, but if you require robust, higher accuracy sensors, it might be more costly. If you require a single sensor it might not increase its cost if it is a standard design, but the more customised your design the more development cost will be included in your sensor. Development costs will easily be absorbed by manufacturing volumes of temperature sensors. If you do require 1000’s of temperature sensors, or sensors on a regular basis, we can work with you to produce massive cost reductions by design for manufacture principles with varying levels of automation and simplification. We often work with OEMs where this is the case and help them to keep their unit costs for temperature sensors down while providing the perfect temperature sensor for their application. Cables, ceramics and other sensor components all have standard sizes. Being flexible in your temperature sensor design will enable you to reduce cost by choosing components in standard sizes. Special sizes will be available but will require custom manufacture and may have minimum order quantities. There is a general rule that small diameter sensors are usually cheaper up to a certain point. Very small diameter sensors are often more costly as they are more intricate to manufacture and are very fragile. As mentioned in temperature requirements, your measuring temperature will affect sensor selection but also the higher the measuring temperature the more expensive the sensor component materials. When you are at the operating limits of a type k thermocouple, there is quite an increase in moving to type r thermocouples to measure the higher temperatures. Over estimating the temperature of your process can increase temperature sensor cost, when cheaper alternatives may be adequate. A sensor design can be cost effective to replace if it fails, or you can design a sensor to be very robust to increase maximum lifetime. You will need to conduct a cost benefit analysis in order to decide which option suits your process. We have helped customers move from both options to the alternative. Customers have been using cheap sensors that fail often and have found that by increasing the robustness of the sensor although it increased cost per unit, in the long run it was cheaper. Looking at the opposite, we have helped customers which were using costly, over engineered sensors. By switching the customers to cheaper, easy to replace sensors, although they witnessed more failures in the long run their costs were also reduced. How long you require a sensor to last is very specific to your application. We also manufacture ‘fault-free’ temperature sensors that are designed to not fail through normal use. 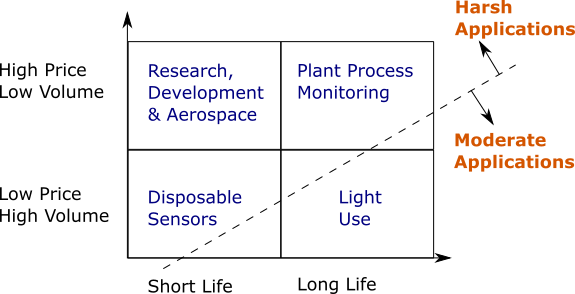 Being able to reuse components when sensors fail may help to reduce their replacement cost. Components such as heads and temperature transmitters can be reused in new sensors to help reduce cost. It is our environmental policy to work with customers to help minimise the impact of our products on the environment through reuse of as many components as possible. We also comply with the Restriction of Hazardous Substances in Electrical and Electronic Equipment (ROHS) Directive. Rare metal thermocouples such as type r, type s and type b contain precious metal wire which is a significant cost of the temperature sensor. We are able to recycle this material which will help reduce the cost of repairing and replacing your existing sensors. As mentioned when looking at accuracy, temperature sensors can be calibrated with both UKAS and laboratory traceable calibration. Both types of calibration will have costs associated but also the number of temperature points you have calibrated will affect cost as each point is added cost. You can also decided to calibrate every individual sensor or batch calibrate a sample of produced temperature sensors. All of our temperature sensors have a standard lead-time for manufacturing. We carry stock of most sensor components but specialist materials will need to be ordered. As with most manufactured products requiring something quick can often carry a premium because production schedules will need to be rearranged or quick delivery of sourced components arranged. The more information you can gather about what you require, makes it easier to help us design a temperature sensor that will meet your requirements and budget. Temperature sensors consist of not only the sensor but means to protect it. More time is spent choosing the best method of protection than choosing the type of sensor. The way a sensor is protected is called the protection sheath and its selection can be independent of the type of sensor. The protection sheaths main aim is to defend the temperature sensor from the environment and your process. Without protection the temperature sensor lifespan and accuracy could be impacted. The most important design consideration when looking at this type of sensor is how the sensor will be connected and mounted to your process. The most important design consideration when looking at this type of sensor is the selection of protection sheath to protect the sensor from high temperature or chemical attack. Moderate and light use temperature sensors are not used to their limits. They can be cheap, long lasting and are often designed in an easy to use form. Flexible cable temperature sensors are made from readily available temperature sensor cable. They can be a number of different types of sensor including: resistance thermometers, thermistors, integrated circuits or thermocouples. The measuring point is usually protected by a metal pocket or plastic coating. The temperature limit is determined by the maximum temperature of the cable. These sensors can be cheap to make. Both ends of the sensor can be highly customised to your needs e.g. 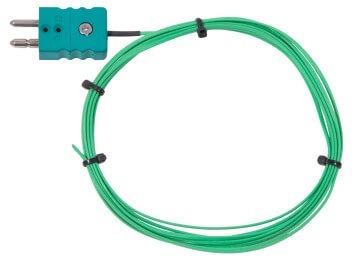 fast response measuring tip and a plug termination for connecting to equipment. Flexible cable sensors can have a vareity of hot end configurations, meaning the sensor can be protected in a vareity of ways and also attached to your process in a number of ways. Below are some options for measuring point protection with links to some example temperature sensors designs. The following sensors are only examples. The designs and materials of the thermocouples, resistance thermometers (RTDs) and protection sheaths can vary according to your personal requirements. If you have any questions or need temperature sensors manufactured, please contact us. 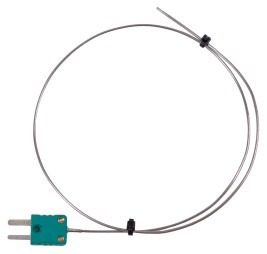 A metal pocket is the most common hot end protection for a cable temperature sensor. The sensor and cable are secured into a metal tube which is closed at the hot end. This provides protection for the sensor and also an easy way to immerse the sensor into a process. A ceramic pocket is very similar to a metal pocket but not as common. Generally you will use a ceramic pocket over a metal pocket if you are measuring a higher temperature. A temperature sensor can be attached to a washer, eyelet or ring. This can they be easily attached to a process with a screw or bolt. 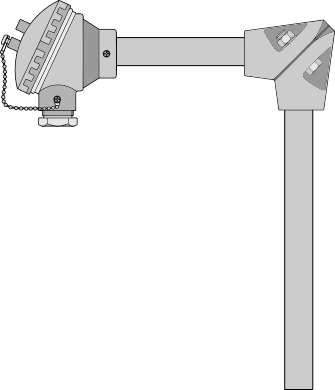 A temperature sensor can be attached to an adjustable pipe clamp/clip for measuring the temperature of pipes. This type of cable temperature sensor is often used in HVAC applications to find out the temperature differential between two pipes. 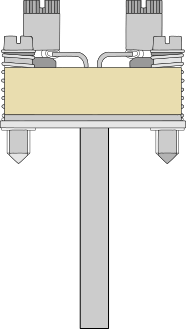 A temperature sensor can be embedded within a bolt which then can be easily attached to a process. A temperature sensor can be attached to a small foil leaf. This is useful for measuring the temperature between to objects or in small spaces such as between heater bands. A temperature sensor can be attached to a bayonet fitting/connector. This can be spring loaded to keep the measuring point in contact with the process. Bayonet thermocouples are often used in plastic extruders and injection moulding machines. Some applications are so mild that the sensors require no hot junction protection, or even insulation. These are the cheapest temperature sensors to manufacture. They are no less reliable or accurate than any other sensors, but they are clearly vulnerable to dust, dirt or abuse. We would recommend them for short term or limited use only, unless a suitable housing is used. They can be so cheap that they are disposable. Exposed junction sensors come in a number of different options. From very basic sensors, to sensors with some insulation. Basic temperature sensor elements like these are supplied uninsulated and generally need further assembly into sheaths or equipment. They can be supplied as replacement elements for broken sensors if it is economical to do so. The next level of complexity for a basic temperature sensor is to add some insulation. This ceramic insulation can come in a number options. Either a single length of ceramic is used, or a number of small sections of ceramic insulator are used to add a small amount of flexibility, finally fish spine ceramic beads can be used as insulation. Rather than ceramic insulation, plastics or glass fibre can be used on each wire to insulated the temperature sensor conductors. Each leg or wire can be either left loose or twisted together. These basic sensors can still have further protection added or further assembly conducted into equipment. The maximum operating temperature of the sensor will be dictated by the type of insulated used. The final level of insulation that a basic sensor can have is instead of having individual wires or wires twisted together, the insulated wires can be protected by an outer sheath to form a cable temperature sensor. This still is a very inexpensive component for equipment manufacturers to install. A variety of options of cable type and sizing means this is a very flexible design that can be tailored to your exact needs. Sensors mounted in rigid metal tubes provide an inexpensive sensor which is reasonably robust. Sensors can be supplied straight or bent according to your specification. As the sensor is produced and fixed into a metal tube a seal can be placed in the tube. There is therefore no pot seal or other increase in diameter at the cold end of the sensor. Any commercially available metal tube can be used and many sensor types inserted into the tube. This gives a huge range of combinations. The tube can have process fittings welded, head connection components attached, or deformed for a variety of application reasons. As the sensor is not being exposed to the toughest conditions it is usually made of Stainless Steel, although other materials are available. Robust rigid tube of stainless steel, supplied straight or bent. Below are some rigid metal tube temperature sensors designs. Links are available to datasheets for each sensor design. The designs and materials of the thermocouples, resistance thermometers (RTDs) and protection sheaths can vary according to your personal requirements, below are only some examples. Contact us and we’ll help you decide on the most appropriate design for your application. This is the simplest design. The metal tube transitions to flexible temperature sensor cables, with or without a pot seal. Instead of tails a plug or socket can be fitted. 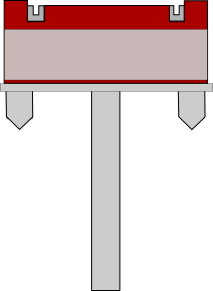 The rigid metal tube is attached to a standard DIN plate which is then connected to a temperature transmitter. The transmitter converts the sensor signal to a format favoured by instrumentation such as 0-20 mA. This enables to sensor to be easily attached to an instrument. This is still an inexpensive sensor design and is often used in pocket or head assemblies. A compression fitting can also be added. The cold end maximum temperature will be determined by the operating temperature of the transmitter. A wide variety of terminal heads can be added to the cold end of a temperature sensor. We can provide many standard designs such as KNE, KS, DIN B, ALA, BUZ. 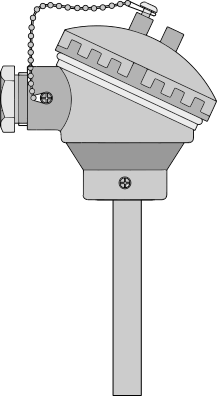 A terminal heads protects the terminations from both physical damage and isothermal errors. Most heads are IP rated between IP65 and IP67. Within the head either loose tails, temperature transmitter or ceramic block is fitted. Temperature sensors with terminal heads are most suited for quick replacement in plants. Similar to a sensor with temperature transmitter. The rigid tube is attached to a standard DIN plate, but a ceramic block is mounted instead of a transmitter. It is a very inexpensive design that is suitable for pockets, heads and quick replacements. It can be spring loaded to ensure good thermal contact with your process. A rigid tube sensor can be attached to a plastic handle. This enables the sensor to be easily used in either in an industrial environment or as an insertion probe for food manufacture and processing. After the handle leads and tails can be terminated with a plug to easily connect to instrumentation or hand held readouts. The sensor can be supplied with reduced or pointed tips for easier process insertion. 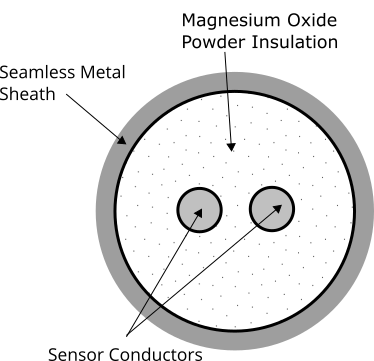 Mineral Insulated Metal Sheathed (MIMS) Temperature Sensor Cable has conductors surrounded by an inert tightly packed powder (Magnesium Oxide). The powder is held in place by a metal sheath. Insulation resistance of over 100MΩ is possible between each conductor and between the sheath and any conductor. For use in moderate applications, an mineral insulated cable is used because it is readily available, tougher than flexible cables, easily bent into unusual shapes and remains there, and is a generally very robust product. All mineral insulated sensors we supply conform to IEC 61515:2016 – Mineral insulated metal-sheathed thermocouple cables and thermocouples. Below are mineral insulated temperature sensors designs. Links are available to datasheets for each sensor design. A basic seal is the easiest, cheapest and most simplistic cold end design. It does not offer any cold end protection and is only suitabe for assembly into your own high volume equipment or to fit your own cold end fitting. The mineral insulated cable is sealed with an epoxy with the temperature sensor conducts bare above the seal. This is a simple design. The mineral insulated cable transitions to flexible temperature sensor cables, with or without a pot seal. Instead of tails a plug or socket can be fitted. The mineral insulated cable is attached to a standard DIN plate which is then connected to a temperature transmitter. The transmitter converts the sensor signal to a format favoured by instrumentation such as 0-20 mA. This enables to sensor to be easily attached to an instrument. This is still an inexpensive sensor design and is often used in pocket or head assemblies. A compression fitting can also be added. The cold end maximum temperature will be determined by the operating temperature of the transmitter. Similar to a sensor with temperature transmitter. The mineral insulated cable is attached to a standard DIN plate, but a ceramic block is mounted instead of a transmitter. It is a very inexpensive design that is suitable for pockets, heads and quick replacements. It can be spring loaded to ensure good thermal contact with your process. A standard plug at the cold end of a mineral insulated temperature sensor enables the sensor to be easily replaced or moved. It can be plugged into various instrumentation. The plug is attached to the mineral insulated cable with a pot seal. Standard plugs are colour coded to enable identification of that type of temperature sensor they are connected to. A miniature plug at the cold end of a mineral insulated temperature sensor enables the sensor to be easily replaced or moved. It can be plugged into various instrumentation. The plug is attached to the mineral insulated cable with a pot seal. Standard plugs are colour coded to enable identification of that type of temperature sensor they are connected to. The sheaths are sometimes used alone, but usually have either a metal shank attached, or have a shank and head. This provides a full enclosure for a sensor insert and to allow a process connection to be used without risk of damage to the ceramic. The materials used for these sensors must withstand the chemicals and the pressure associated with Chemical Plants. The potential for accidents is high, this demands material certification, pressure testing and a range of other contractual requirements. The starting materials can be commercially available alloys, special melts and forged grades. Very often sheaths and sensors are built to customers own drawings. 321 SS Commonly called 18/8. Excellent corrosion resistance and remains ductile. Used for MI sheathing for type J and Pt 100’s. Withstands hot crude oil products, steam and combustion gases. Carbon dioxide to 650 °C. Air up to 900 °C without temperature variation. 316 SS Excellent corrosion and pitting resistance. Similar to 321 SS but with better acid resistance. Usually used in chemical plants and many other industrial applications. Monel 400 Resists sea water, steam, Salt and caustic solutions, Used in heat exchangers Other Monel materials available. Hastelloy C276 Corrosion resistance in reducing and oxidising atmospheres. Severe environments, Maintains corrosion resistance after welding. Hastelloy B2 Significant resistance to reducing environments, and many acids. 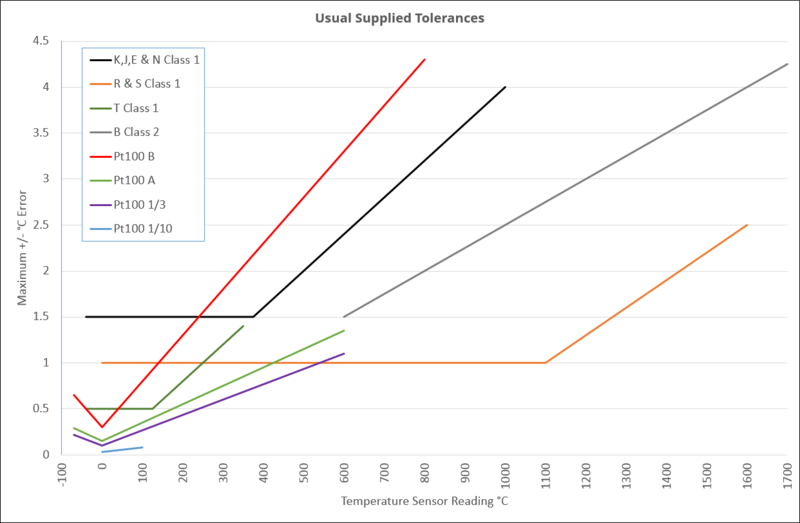 There can seem like there are many things that need to be taken into account when designing a temperature sensor. The key is to determine what are the critical factors which relate to your process or product and dismiss the rest. If you over engineer your temperature sensor it won’t be economical. What is your temperature range? What are your accuracy requirements? How many sensors do you need? What are the size requirements or restrictions? Diameters? Lengths? Is it light use at ambient temperature, or harsh use at extremes of temperature, under attack? Some of these might be “don’t know” or irrelevant but we’re here to help.